Are you ready to take your water recreation to the next level? If you’ve got a boat, you’re going to want a towable tube. 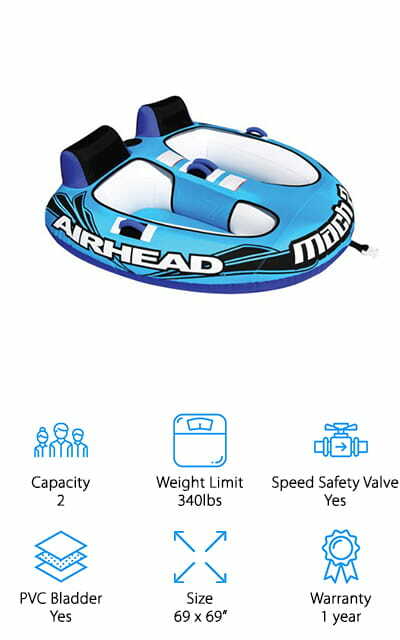 You can load up your kids or friends on these tubes and pull them behind your boat for an amazing experience! We’ve put together this towable tube buying guide to help you choose the tube that will give you the maximum fun payout! First, let’s look at what you need to know to start shopping. Capacity: This refers to the number of people that can safely use the tube at one time. Otherwise, the tube might turn over or not perform as intended. There are usually only enough seats for the maximum number of people. 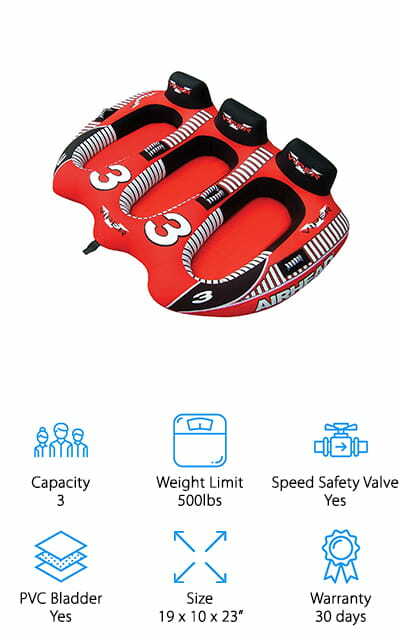 Weight Limit: This is a separate value from the capacity of the tube and should always be considered over the number of people the tube is rated for. To safely operate the tube, you should not go over this weight. 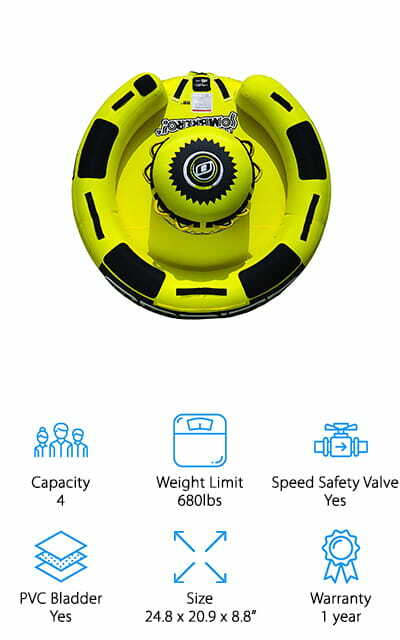 Speed Safety Valve: The Speed Safety valve is included on most towable tubes. It allows the inner air bladder to be inflated or deflated quickly and easily. Just release the valve and you’re good to stay or go in minutes! PVC Bladder: Tubes have two parts: the cover, and the inner bladder. This PVC bladder Is the part that actually inflates. It’s heavy-duty and even sometimes has welded seams to keep itself inflated in extreme conditions, like a boat’s wake. Size: This refers to how big the tube is, which might be important for some boats. A bigger tube can often support more weight and more people on it at one time. Smaller tubes will be rated for less. Warranty: You want your tube to work, and most companies do as well. That’s why they offer a refund or replacement if your tube doesn’t work. It’s protection for your purchase and for your peace of mind. Let’s get to our towable tube reviews! If you’re in a hurry to get back out on the water, check out our top pick and budget pick first to give you an idea of what’s available. Afterward, check out the rest of our list for a unique selection of the best towable tubes that we could find. You’re sure to find the next piece of your summer water fun gear – and it’ll be fun for the whole family! The Airhead Mach 2 is the best two personal towable tube on our list. There are dual towing points that you can use to hook the tube to your boat, allowing for multiple fun riding positions. It connects quickly no matter which direction you choose to toe it. 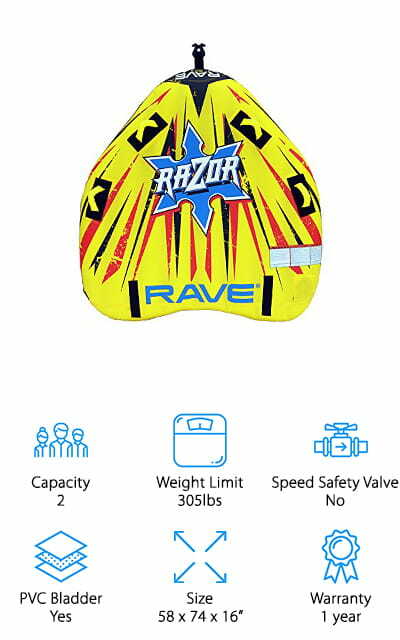 There’s a speed safety valve so it can be quickly inflated or deflated to get your fun started in no time at all, as well as nylon handles with knuckle guards made of neoprene to protect your hands from the sting of water hitting them. The nylon cover is heavy-duty and will last for years no matter how often you use it. There are EVA pads strategically placed at points that will protect knees and elbows when your riders are having fun. We love the way this tube looks and functions. It’s sure to be fun for your whole family, as long as there are only two riders at a time! Our budget pick is the Rave Razor 2-Rider Tube, which features four foam-filled handles that are covered with nylon and protected by neoprene knuckle guards. There are also neoprene chafe guards to protect your skin after long days on the water. It’s a deck tube, which means that it’s mostly flat and you can do all sorts of tricks with it. 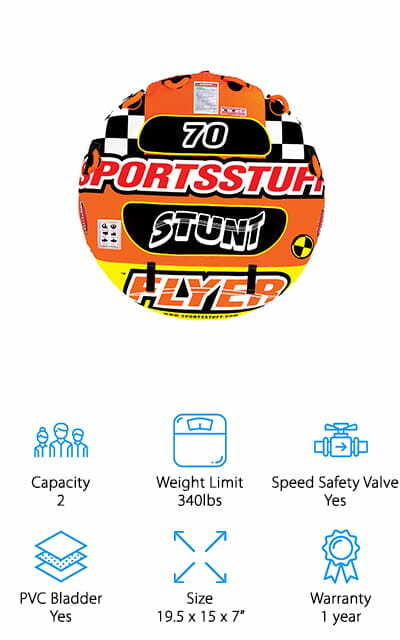 This is one of the cool towable tubes that has a bottom graphics, so during stunts, everyone will be able to see the bottom of your craft! And it won’t fade with sun or use, so you won’t have to worry about that. It’s formulated to repel water and dirt. The surface of the bottom is fast, and the ride is really slippery, which makes it that much more fun! It’s maneuverable and is even awesome among one person towable tubes. It’s really quick to connect this tube to your boat, and go have fun! The O’Brien has the capacity for two riders and is made of a heavy-duty, 26 gauge PVC for the bladder. It’s covered with 42D Nylon which means that it’s hard to rip and won’t fade with sun or use. There are six handles with EVA foam knuckle guards to protect your hands from the sting of the water, as well as EVA pads on the top side so that it’s more comfortable. It features pull-up straps so you can get into the boat easily (even while it’s on the water). It’s 70” in diameter when it’s inflated. It’s got a Speed Safety Valve, so you can use an electric or hand pump with an adaptor to make sure that it fills up super quickly and easily. It’s one of the best 2 personal towable tubes on our list, as well as one of the best towable tube for kids! It’s a deck tube so it’s easy to do tricks. The SportsStuff Stunt Flyer hooks up with an aluminum tow point that’s extra reinforced. Your kids can ride on one of these towable tubes and you’ll have peace of mind. There are EVA foam body pads placed all over this tube so that you can be comfortable. The nylon cover is double-stitched and fully covers the heavy-duty PVC bladder. You can remove the PVC bladder because the nylon zips and unzips, allowing for quick repairs of both parts. The foam handles are double-webbed and have knuckle pads to protect your hands. There are pads protecting knees and elbows, and they enable various riding positions on the tube itself. It’s a stunt deck tube, so you can have fun twisting and flipping on it! There are custom graphics on the top and bottom, and you can show it off. It’s one of the best rated towable tubes that we looked at. It even has drain vents to keep water out of the cover! 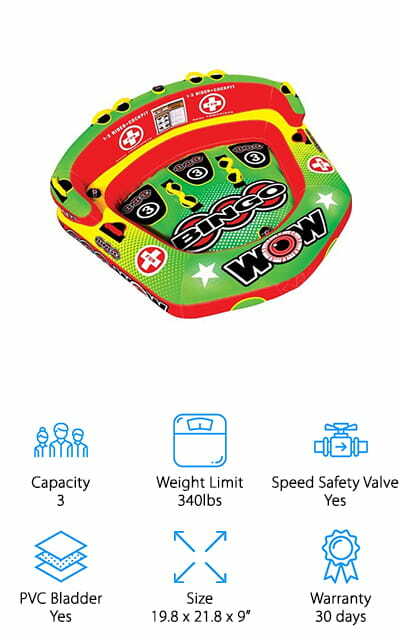 The WOW Bingo Inflatable is one of the best cheap towable tubes on our list. There are knuckle guards to save your hands, and the handles are double-webbed so you won’t have to worry about the handles not staying attached to the nylon covers. The bottom of the craft is inflated, so there’s an air cushion between you and the water. It also prevents the tube from dragging as much as other models. There are heavy duty zippers to keep the nylon cover on, and for easy removal of the PVC bladder if it needs to be removed for repair. The tow connector is aluminum so it’s heavy-duty and you won’t have to worry about it while you’re towing. 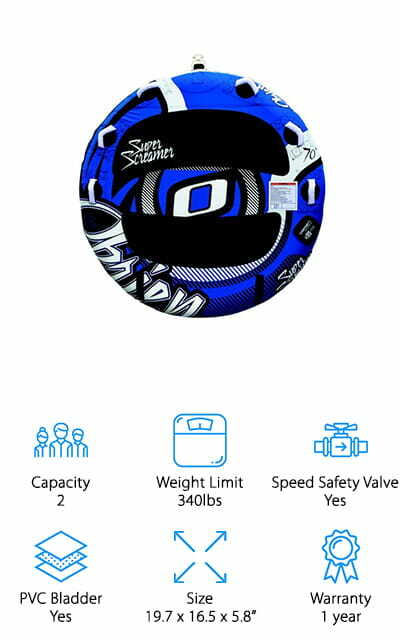 It’s great for younger teenagers, due to the weight capacity as well as the 3-rider limit. We love the drop speed bottom and that you can use it with the air pump that you already have. The Airhead VIPER is a cockpit-style tube that fits three riders at the same time. The bottom is shaped like a boat hull, which provides a stable ride and endless entertainment for your riders! There are a couple of 30-gauge bladders that make the tube up, covered with double-stitched nylon. There are 6-striped nylon-wrapped handles that come complete with neoprene knuckle guards. There is no exposed PVC on this tube. The safety valve is covered with an EVA Cap to keep it from flying off when you’re having fun in the water. You can feel comfortable with inflated floors and the boat hull style bottoms. The graphics on the nylon cover is inspired by racing. 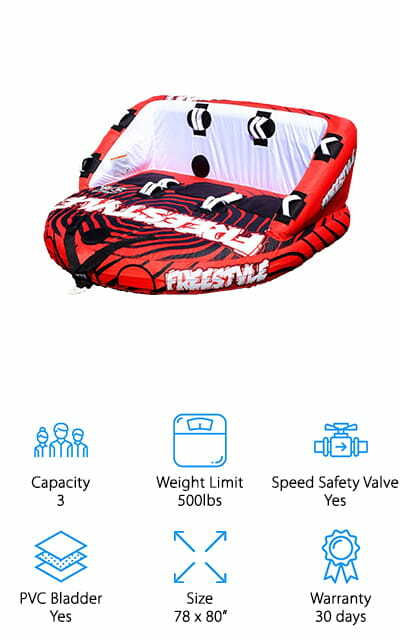 It’s one of the best 3 person towable tubes that we found! We love how cushioned and comfortable that this tube looks, as well as the fact that it has a boat hull bottom that allows it to work better. Here is another tube from O’Brien. The Sombrero is unique because it’s round. Instead of lying prone on the tube, you sit around it like a raft at an amusement park. 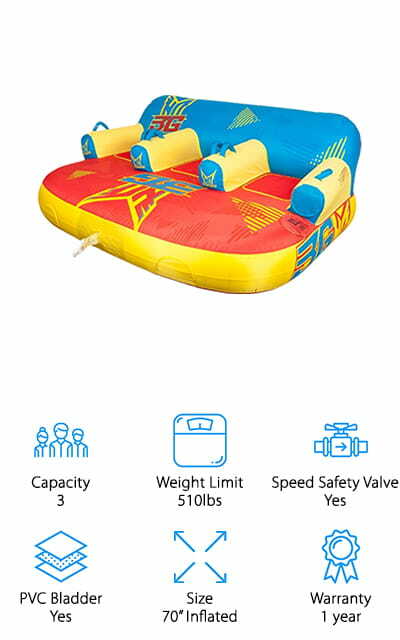 It sits 4 people maximum with lightning speed valves that inflate and deflate it quickly. The tow hooks connect quickly, and there are three different inflation points around the tube. The design is really unique! For best results, you need to use a 4,100-pound tensile strength tow rope between your boat and this craft. The points are reinforced! There’s a centerpiece in the middle of this raft that has handholds all around it to promote that theme park raft ride feel when you’re moving across the lake. We love the unique design and the fact that this tube is bright yellow. You’re sure to turn heads on the water with this tube. It’s one of the best rated towable tubes that we found, as well! This Hyperlite Towable Tube has a softshell construction. It looks like a couch with three different seats. It really looks like a floating lounge when you have it on the water! And it’s reversible so you can either sit on it like a sofa or turn it around, tow from the other side and kneel on it. There are twelve handles on the arms of the seats as well as along the back for the other towing orientation. The nylon covers are resistant to sun, so you won’t feel hot all the time when you’re riding this tube! There are speed valves for quick inflation and deflation, so you can get on the water quickly and deflate it when you’re ready to go home. The comfortable design is not really typical in towable tubes for boating, making it unique. We also love the colorful design. It looks great and is super fun to ride and tow! Connelly is one of the most trusted names in towable tubes – and they make a lot of different types. 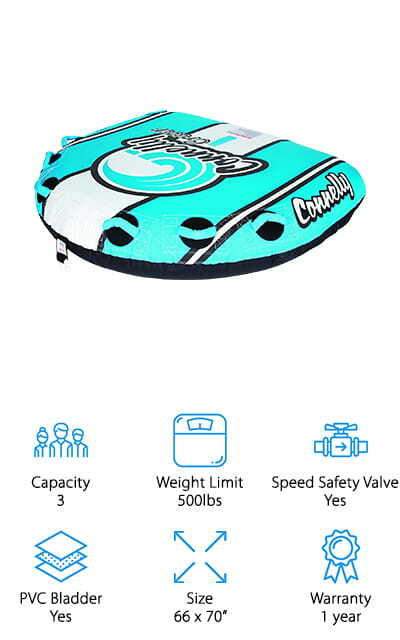 This particular model is a deck-style tube, meaning that has more surface area for more fun and better water coverage, as well as having a low center of gravity that reduces rolling. It tapers, with a larger front and smaller back, which reduces drag and stabilizes the tube so it has a harder time flipping over. We love how technical and thoughtful the design of this tube is! You can ride it from multiple positions for multiple fun! The speed valve lets you get on the water quickly, and you just have to hook it to your boat to get the fun started! The disc design increases speed, and it has a nylon cover to prevent damage. It even comes with a repair kit! All this combined makes it one of the best towable tubes for sale! The Freestyle Squad Towable Tube is such a funky design, you’re sure to be the talk of the water. It’s fully covered in nylon and pulls in two different directions so you can ride it however you like! There are 16 handles along the tube with EVA knuckle guards. You can ride in the kneeling positions, prone, or seated on the comfortable foam pad that makes up the bottom of the tube. There’s even a backrest so you can lounge on the water! This is such a versatile tube. You can tow it from the front or reverse to give your riders the best time. The cover is fully made of double-stitched nylon, and the handles have double-webbing to keep them secure. There are even EVA knee pads for when you’re kneeling, to keep you comfortable no matter how you want to have fun! We love how quick and easy it is to connect the tow system!